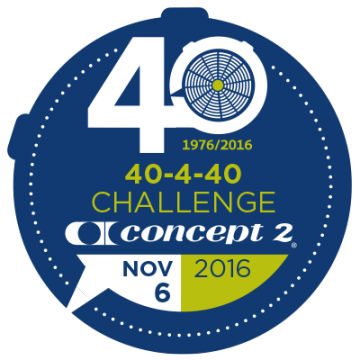 This November sees the 40th anniversary of Concept2. From making our first oars back in 1976 in an old farm building through to the present day has been a long journey, and one we couldn't have made without you. We've enjoyed seeing how big our community of rowers (and now skiers!) has become. One of the things that has grown in that time has been the Online Logbook and Rankings. When we started this back in 1999, we couldn't have imagined how big it would get. Every day thousands of people from around the world log their times, either on the website, via their mobile phone, or uploaded from their computer. If you're competing at the top of the rankings, sharing your workouts with your friends, or tracking your lifetime meters, we'd like to thank you for being part of our world. With that in mind, we couldn't think of a better way to celebrate our anniversary than with a special one-off anniversary challenge. All you have to do is row or ski for at least 40 minutes for our 40th Anniversary on November 6 (40-4-40, if you will). As well as our usual prizes, the first 20 randomly drawn participants will also receive a Concept2 t-shirt. For more on our 40-year history, check out our 40th Anniversary subsite. Row or ski for at least 40 minutes on November 6. You can row/ski all at once in one workout or over several workouts throughout the day. Indoor rower, SkiErg, on water and on snow meters count. You can combine your workouts to get to your total of 40 minutes. Name inclusion on the 40th Anniversary Challenge Honor Boards. All participants will be entered in a draw to win one of 20 Concept2 t-shirts. Option to purchase a 40th Anniversary Challenge items from our third-party fulfillment vendor (availability varies by country).